T H White lecturing on one of his novels in Boston College as a special guest. Terence Hanbury White (29 May 1906 – 17 January 1964) was an English author and historian. He was known for his autobiography and his books. Some works in his career that support this are The Sword in The Stone, The Once and the Future King, and The Candle in the Wind. In the beginning of his life, Terence Hanbury White was born in 1906 in India but he might live as a British since his father was a superintendent in the Indian police. .Fourteen years later, White’s father and mother broke up and he was raised by his grandparent (parent of his parents)( did not affect his works). Few years later, he studied in Cambridge University . When Terence Hanbury White was 20 years old, he wrote his first book in Cambridge University. After he finish his study in Cambridge University, He got work as a teacher. He also continued writing, writting books about world outside of the building like hunting (killing some animals for food) and fishing. Few years later, his book about himself England Have My Bones became famous and he might have decided to become a full-time writer. He seemed to use a lot of time on go over his writing and reading a lot of hard person such as King Arthur. King Arthur gave him a lot of thing to write for his book when he became a writer . When he was in the college, he read some books that were written by Sir Thomas Malory's Le Morte d'Arthur . This book could make him to write some stories about King Arthur. Terence Hanbury White wrote a lot of great books. For example The Sword in the Stone, The Queen of Air and Darkness and The Candle in the Wind. All three books show people the life of King Arthur. Terence Hanbury White might have been changed by Sir Thomas Malory's Le Morte d'Arthur , a remaking of story we have now by Sir Thomas Malory about the famous King Arthur, and decided to make his own story about King Arthur. White wrote these three books as a series of how King Arthur became a famous person in the history . The Sword in the Stone is about king Arthur’s when he was very young. The Queen of air and darkness is about Arthur ’ s early days as a king. The Candle In the Wind is the end of King Arthur story. It is possible he made people around the world know King Arthur’ s life when he was very young better. This book about King Arthur probably is probably the most famous book about King Arthur . In his book, The Sword in the Stone, he wrote, “On Mondays , Wednesdays and Fridays it was Court Hand and Summulae Logicales, while the rest of the week it was the Organon, Repetition and Astrology.” The Once and Future King was known by a lot of people in 1960. In 1946, he wrote Mistress Masham's Repose. One year later, he wrote The Elephant and the Kangaroo . In 1951, he wrote The Goshawk. Six years later, he wrote The Maste. In 1963, he worked with The Walt Disney to make movie The Sword in the Stone. In 1964, people found his body on a boat (The Editors of Encyclopaedia Britannica ). He might have been involved in a boat accident. Throughout his life, he wrote a lot of stories about King Arthur. His life might have been hard when he was young because he was raised by his grandparents. But he made his life better and made himself famous when he started writing some books. He made the world know more about the story of King Arthur. White died on 17 January 1964 while on a ship near Athens, Greece of heart failure at the age of 57. ↑ 1.0 1.1 1.2 1.3 "T.H. White". Biography. ↑ "T. H. White - British writer". Encyclopedia Britannica. ↑ "T. H. White Dead; Novelist was 57" (fee required), The New York Times, 18 January 1964. Retrieved on 2008-02-10. 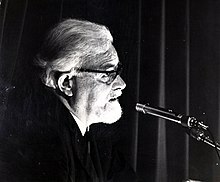 Wikimedia Commons has media related to T. H. White. This page was last changed on 13 April 2019, at 22:06.